It’s that time of year again – time to think about Pancake recipes. 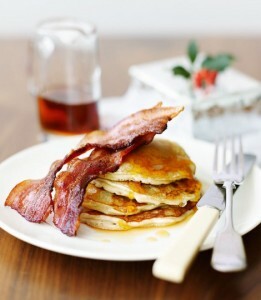 Pancakes take on many shapes, sizes and flavours, and can be sweet or savoury. In fact, there must be a Pancake recipe that suits just about everybody on the planet. So I think that I will look up those recipes that I personally love, and hope you enjoy them too. 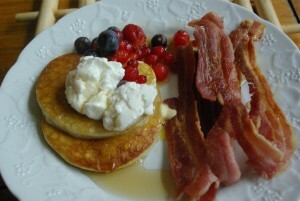 After searching for all kinds of Pancake recipes, this basic one is taken from the Good Food website, and it has the ability to be used for both sweet and savoury pancakes. The choice is yours, and I will give a few more choices of the sort of recipes I love to eat. This recipe is to make approximately 12 pancakes using an 8 inch (20cm) frying pan. Some recipes recommend using a tablespoon of vegetable oil instead of the 25g butter to the basic mix - I have done this often. Sift the flour with a pinch of salt into a medium sized bowl and make a well in the middle. Mix the milk and 100ml of water together. Break the eggs into the well and start whisking slowly. Add the milk and water in a steady stream, whisking constantly and gradually incorporating the flour as you do so. Whisk until the batter is smooth and all the flour has been incorporated. Set the batter aside to rest for 30 mins, then whisk the melted butter into the batter. When ready to cook, heat the pan over a medium heat. Very lightly grease the pan with the melted butter. Using a ladle, pour roughly 2 tbsp of batter into the pan and quickly swirl it around so that the base of the pan is evenly coated. You want to use just enough batter to make a delicate lacy pancake. Cook the pancake for about 45 seconds on one side, until little bubbles come on the surface, and when the underside is golden, use a fish slice or palette knife to flip the pancake over and cook on the other side for about 30 seconds until it is golden. Slide the cooked pancake out of the pan and either serve immediately or stack on a plate with baking parchment in between. Continue cooking until all the batter is used up. If you want to make your pancakes and freeze them, cook each one and separate with baking parchment and let them go cold. Wrap in such as cling film or in a large tub, and freeze. If you want to create a special Pancake recipe for those with a sweet tooth, using the Classic Pancake mix, the choice of ingredients is almost endless. Imagine these lacey, crispy around the edges pancakes, with a big dollop of Greek yoghurt, scattered with juicy blueberries and drizzled with a little runny honey. 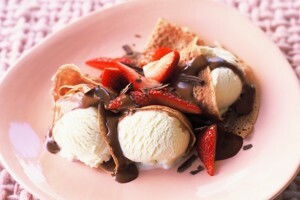 Or how about Pancakes with Hot Chocolate Sauce and Sliced Strawberries. Pure Heaven! This is a great favourite of Erik and myself, and sometime we add fresh berries (when in season) and a big dollop of Creme Fraiche (see Erik’s picture above). Just fantastic! But this next recipe, using the Classic Pancake Recipe mix, is the one lots of people in the UK regard as the classic pancake dish. 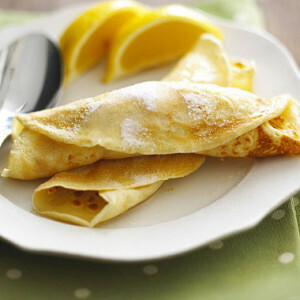 Pancakes with Lemon and Sugar – tangy and sweet at the same time. Who could want for more? 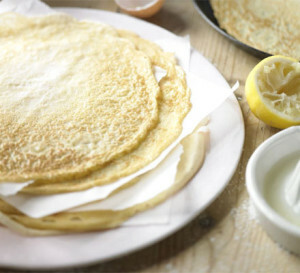 The photograph below, of the Pancakes with Lemon & Sugar, is taken from the Lakeland UK site. If you’re in need of a good crepe/pancake/omelette pan, click on the Lakeland name and it will take you straight to a page with all the pans you could ever need for your perfect pancakes. The next Pancake Recipe is one of my all time favourites. Basically of Italian origin, it can be made with Cannelloni tubes, or just sheets of Lasagne folded over. But I think that making it with Pancakes just gives it a richer taste. I first ate this when Erik and myself spent our first ever holiday together – two weeks in summer staying in an ancient old house, converted into a hotel, bang in the middle of Florence. I believe this special meal was eaten in the Piazza della Signoria, and I was facing the magnificent Palazzio Vecchio. Wonderful memories …… Now that was really a food adventure! Favourite Pancake recipe coming up now. 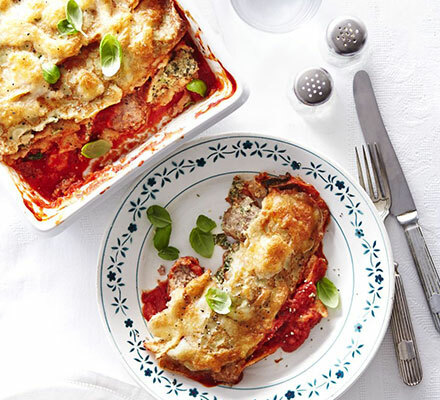 This recipe for Pancakes with Spinach & Ricotta with Tomato Sauce was taken from the Good Food magazine. Good Food added some ready made pork meatballs inside with the filling, and call the recipe Pancake Cannelloni, but I always enjoy these pancakes with just the Spinach and Ricotta filling. Sometimes I finish these off with a slightly cheesy white sauce, warming the milk first with a couple of Bay Leaves before I make up the sauce, and adding freshly ground nutmeg and black pepper. I don't always have the tomato sauce. It just depends how I feel. But the first time I ate this meal in Florence, it was the more creamy version, and I just loved it. Tip the spinach into a large colander over the sink. Pour boiling water over to wilt it, and leave to drain very thoroughly. When cool enough to handle, squeeze out any excess liquid and chop finely. Mix the spinach with the pesto, ricotta, egg and nutmeg then season to taste (I love freshly ground spicy black pepper and a bit of salt). Heat the oven to 190C/170C fan/Gas5. Pour the passata over the bottom of an ovenproof dish (or dishes if you are cooking individual ones) and stir in the garlic. Divide the spinach mixture between the pancakes, spreading it out in a long strip in the centre. Give this an extra grinding of nutmeg. Roll the pancakes up to seal in the filling and them on the passata base. Top with the mozzarella cheese. Bake for 30 mins until the cheese is melted and bubbling. Scatter over the basil just before serving. Be careful, these will be very hot inside. Now these next pancakes are termed ‘crepes’, but are still very similar to the classic pancake mix – with the addition of the herb, dill. But when you add the rich but tangy gravadlax, the pickled red onion and the chilli and chive cream it turns these crepes into something very special. 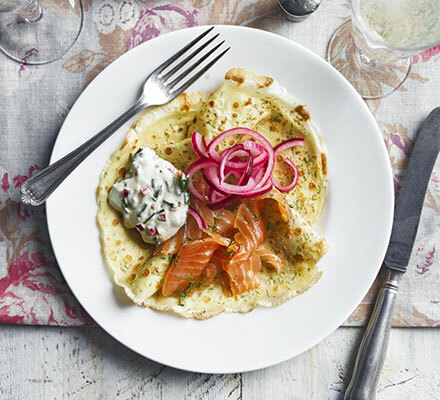 This recipe for Gravadlax with Dill Crepes, Chilli & Chive Cream and Pickled Onions sounds absolutely incredible. I shall definitely be having a go at this one for Erik and myself, and maybe for my oldest friend, Dil, who's coming to visit us soon. The mixture of tastes is so Scandinavian - subtle, slightly earthy but with a creamy tang. Lovely for a special 'brunch' with friends, or a romantic meal, just for the two of you. First, make the crepe batter. Sift the flour into a bowl with a pinch of salt. Make a well in the centre of the flour and add the eggs, egg yolk and half the milk. Whisk together the wet ingredients, gradually drawing the flour into the mix until you have a thick, smooth batter, then stir in the rest of the milk and most of the dill. Cover and leave in the fridge until you are ready to fry the crepes. Meanwhile, make the pickled onion. Put the sliced onion in a small heatproof bowl. Heat the vinegar and sugar with 100ml water and a pinch of salt in a saucepan until the sugar and salt have dissolved. Pour over the onion and leave to cool. Drain the onion, then cover and chill. For the chilli and chive cream, mix all the ingredients in a bowl and season generously. Cover and chill until ready to serve. Heat the oven to 110C/90C fan/Gas ¼. Heat a crepe or frying pan over a medium heat and wipe with oiled kitchen paper. Tip half a ladle of batter into the pan and swirl the pan to spread the batter into a thin, even layer. Cook for 30-45 seconds until the base is golden and bubbles start to break on the surface. Flip over with a spatula and cook for another 30 seconds. Layer the cooked crepes between sheets of baking parchment and keep warm in the oven while you cook the rest. To serve, spoon a little chive cream onto a crepe along with slices of gravadlax, the pickled onion, remaining dill leaves and chilli (if using). Serve with lemon wedges or a dollop of dill and mustard sauce. Gravadlax is another favourite food of mine. I try and kid myself that after last year, having had a ‘poorly’ year, I now have to fill myself full of good and healthy food, salmon being one of them. All those fish oils and vitamins are so good for us. I must confess that ordinary salmon, poached or similar, is not my all-time favourite. But anything to do with Smoked Salmon or Gravadlax is another matter. Just love it, and luckily for us, only a few miles away in Long Riston, is the fabulous Staal Smokehouse. Justins Staal and his team produce the best and most delicious smoked salmon I have ever tasted, and their Gravadlax is superb. If you want to have a look, they have a great and informative website, and sell to all over the UK. So my reason for eating a lot of their very tasty products is not only to build me up, but really it’s because I love it all. The recipe, Gravadlax with Dill Crepes is so ‘now’, with the addition of the Chilli & Chive Cream, plus the Pickled Onion, and is one for us all to try. Have you noticed how pickled vegetables added to a dish seems to be popping up more and more on every chef’s TV programme, so I think it’s about time Erik and myself tried it, to see if it really is as good as our favourite chef’s proclaim. I’ll report back, meanwhile enjoy your pancakes, whether your tastebuds be sweet or savoury.